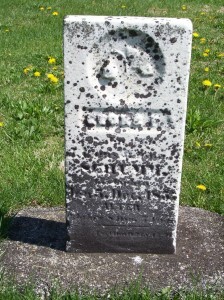 This marble marker is badly weathered and nearly illegible. 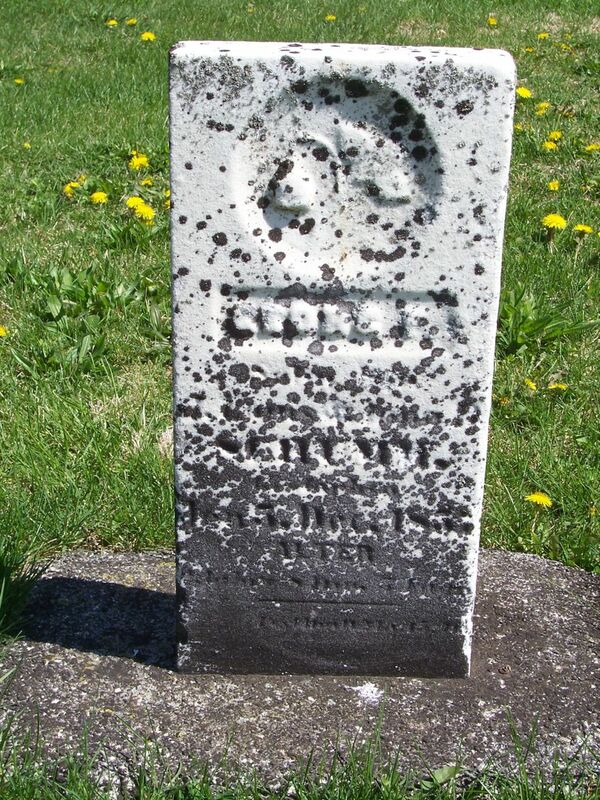 To help transcribe the tombstone for this post I used Zion Lutheran Schumm’s records and Van Wert County, Ohio Cemetery Inscriptions, Vol. V, compiled by the Van Wert Chapter OGS in 1992. The stone was partially legible in 1992 and was transcribed as: Georg Schumm, d. 5 Dec 1852, s/o J. Louis & Anna. The 7 on his year of death probably looked like a 2 when it was read by them in 1992. I can make out a few letters and numbers on the stone and they indicate that this is the same person. The artwork on the marker apears to be a broken flower bud, symbolizing a young life cut short. The church death record indicates that Georg Frederick was the son of the late Ludwig Schumm and that he died on 5 December 1857, at the age of 2 years, 8 months, and 4 days. The record did not indicate his cause of death. Georg Frederick Schumm’s baptism was also recorded in Zion’s records. That record indicates that he was born 31 March 1855 in Willshire Township, the child of Ludwig and Barbara Schumm. He was baptized on 2 April 1855, with Georg & Maria Schumm and Friederick & Magdalena Schumm as sponsors. 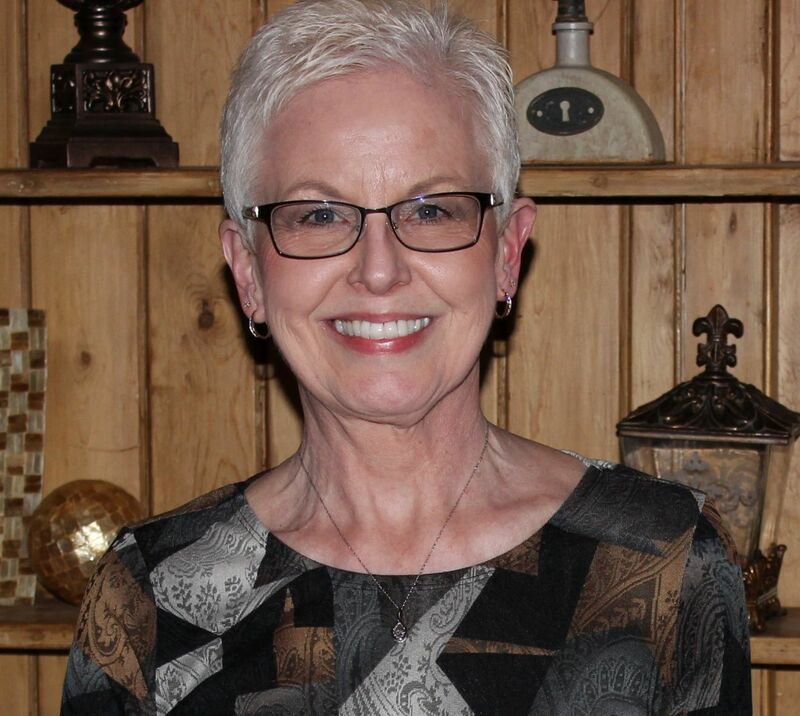 The Schumms, like so many others from that time period, made sure that their children were baptized within a few days after their birth because of the high infant mortality rate. Georg Frederick was the ninth and last child born to Ludwig and Barbara Pflüger. Georg’s father Ludwig died on 22 August 1855, almost five months after Georg Frederick’s birth. Georg’s parents were both immigrants, both born in the Kingdom of Württemberg. He was my 2nd great-uncle.